Two churches on Eighth Street, the Greek Orthodox Saint Sophia's and the Syrian-Greek Orthodox St. George's once anchored a thriving community here known fondly as "the Village." 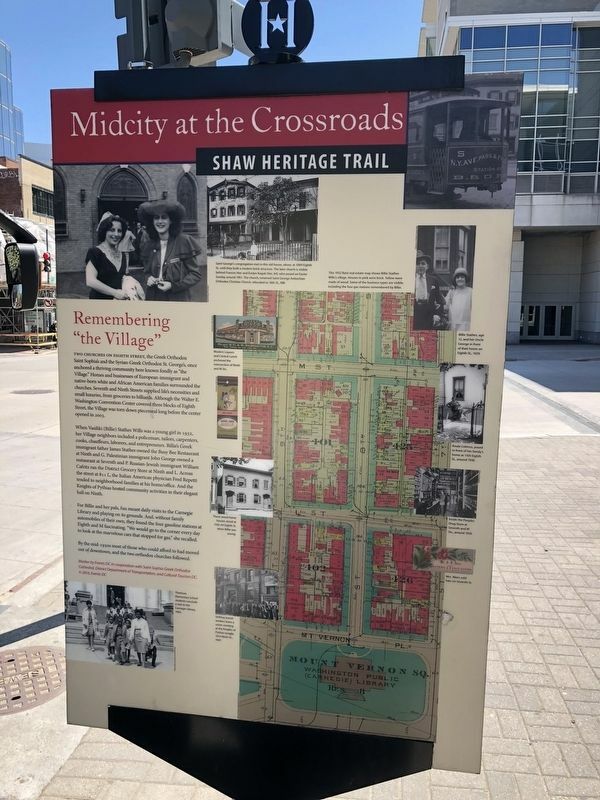 Homes and businesses of European-immigrant and native-born white and African American families surrounded the churches. Seventh and Ninth Streets supplied life's necessities and small luxuries, from groceries to billiards. Although the Walter E. Washington Convention Center covered three blocks of Eight Street, the Village was torn down piecemeal long before the center opened in 2003.
community activities in their elegant hall on Ninth. For Billie and her pals, fun meant daily visits to the Carnegie Library for playing on its grounds. And, without family automobiles of their own, they found the four gasoline stations at Eighth and M fascinating. "We would go to the corner every day to look at the marvelous cars that stopped for gas," she recalled. By the mid-1950s most of those who could afford to had moved out of downtown, and the two orthodox churches followed. 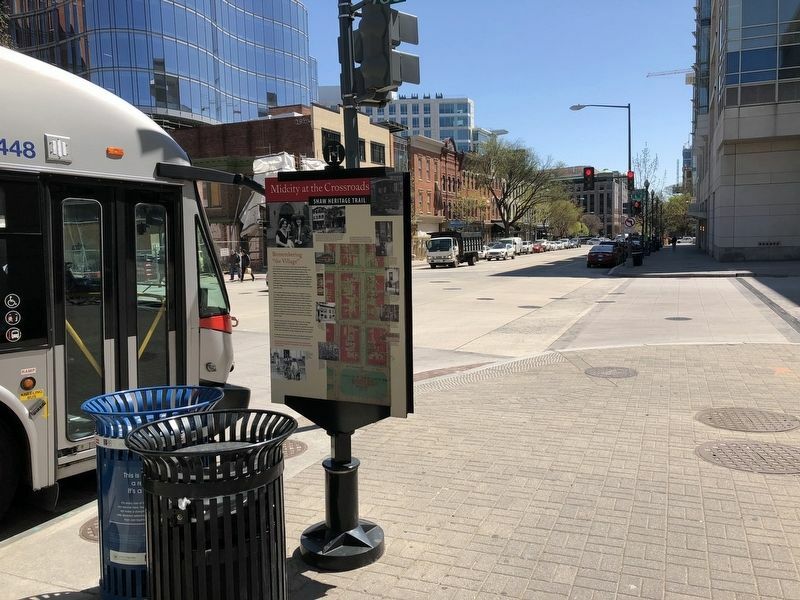 Marker by Events DC in cooperation with Saint Sophia Greek Orthodox Cathedral, District Department of Transportation, and Cultural Tourism DC. Erected 2014 by Events DC. Location. 38° 54.255′ N, 77° 1.321′ W. Marker is in Mount Vernon Square, District of Columbia, in Washington. Marker is at the intersection of 7th Street Northwest and L Street Northwest, on the right when traveling south on 7th Street Northwest. Touch for map. Marker is at or near this postal address: 1100 7th Street Northwest, Washington DC 20001, United States of America. Touch for directions. Other nearby markers. At least 8 other markers are within walking distance of this marker. Roots of Saint Sophia Greek Orthodox Cathedral (here, next to this marker); The Place to Shop (within shouting distance of this marker); Words and Deeds (about 400 feet away, measured in a direct line); Central Public Library (about 600 feet away); Reaching for Equality (about 600 feet away); For the Working People (about 700 feet away); “Sweet Daddy” Grace (about 700 feet away); Power Brokers (about 800 feet away). Touch for a list and map of all markers in Mount Vernon Square. More. Search the internet for Remembering "the Village". Credits. This page was last revised on March 23, 2019. This page originally submitted on April 21, 2018, by Devry Becker Jones of Washington, District of Columbia. This page has been viewed 60 times since then and 12 times this year. Last updated on March 8, 2019, by Devry Becker Jones of Washington, District of Columbia. Photos: 1, 2. submitted on April 21, 2018, by Devry Becker Jones of Washington, District of Columbia. • Bill Pfingsten was the editor who published this page.